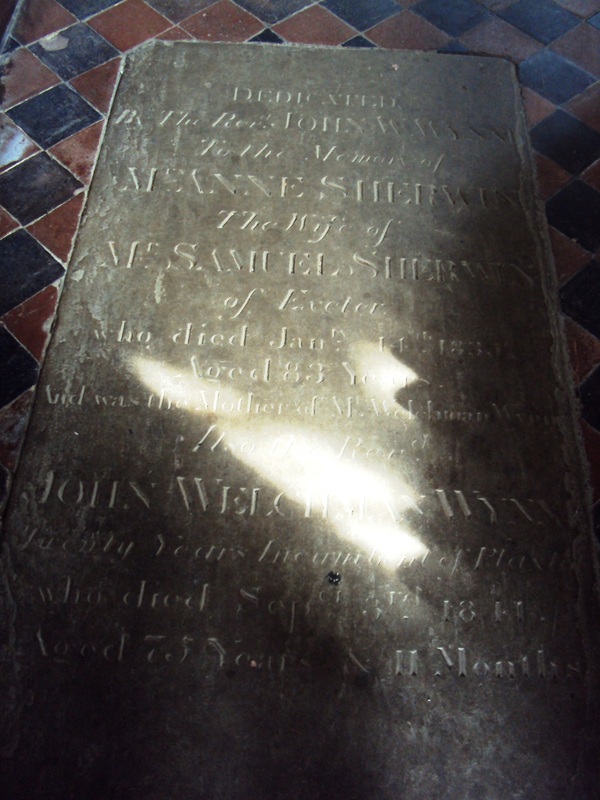 Anne Sherwin of Plaxtol Parsonage was buried in Plaxtol on 21 January 1835, age 83, by the Rev. W Cobb, Rector of Ightham. 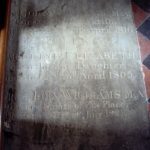 John Welchmann Wynn of Plaxtol was buried in Plaxtol on10 September 1841, age 75, by Mr Buttenshaw, Officiating Minister. 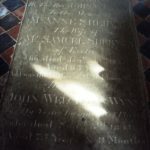 He was the curate at Plaxtol, then part of the Parish of Wrotham, from August 1821 until he died. who died Janry. 14th 1835.
who died Seper. 3rd 1841. 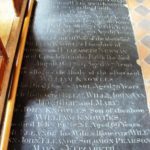 William Knowles and Elizabeth Chilman were married in Plaxtol Parish Church on 23rd October 1750.
the Remains of two Sons & two Daughr. Left issue (viz.) ELIZH, WILLM, JOHN, ANN, THO., RICHD and MARY. Who died Feb.ry 19.th 1824 Aged 69 Years. Left ELEANOR his Wife and Issue (viz.) WILLM. ANN. JOHN. ELEANOR. SOLOMON PEARSON. 4 children died within 6 weeks in July/August 1771, presumably of an illness that affected them all. 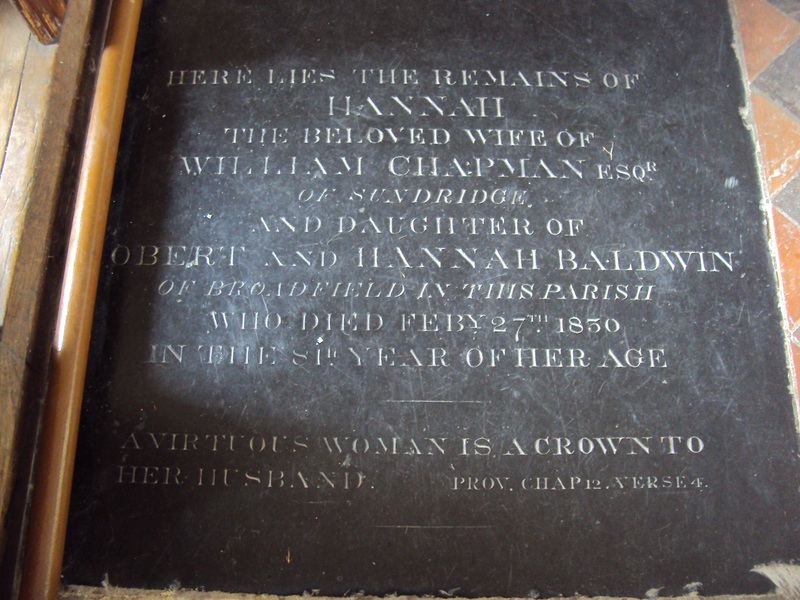 Hannah Chapman was the 3rd and youngest child of Robert and Hannah Baldwin of Broadfield Farm, Old Soar Road, Plaxtol. 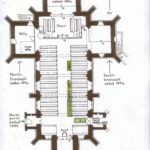 She was baptised in Plaxtol Parish Church on 6th July 1749. 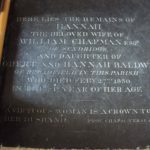 She married William Chapman of Darent, Kent in Plaxtol Parish Church on 30th April 1787 – the witnesses were Margarett Baldwin, John Dolton and Thomas Chilman – the ceremony was conducted by Thomas Dalison, Curate. 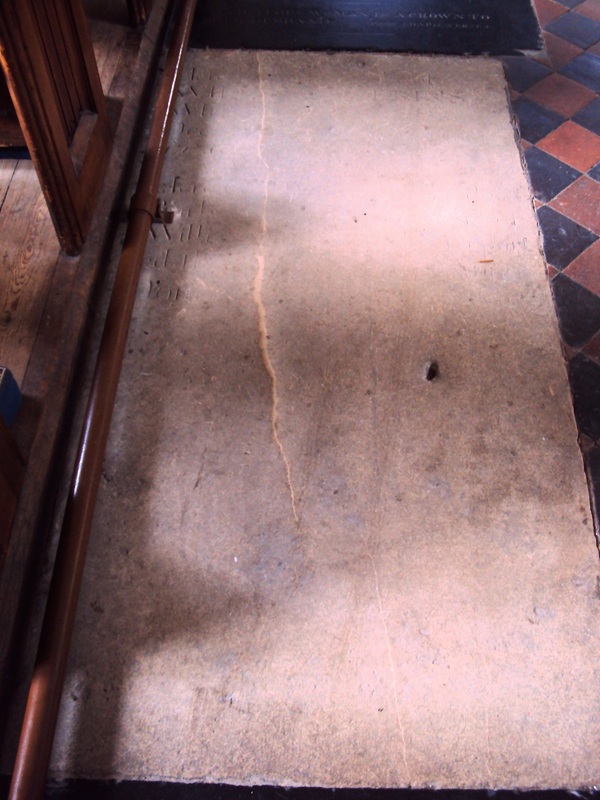 Living then at Sundridge, near Sevenoaks, Kent, she was buried in Plaxtol on 6th March 1830, age 81, by Rev. John Welchmann Wynne. HER HUSBAND. PROV. CHAP 12. VERSE 4. William Collins was buried in Plaxtol on 21 December 1736. 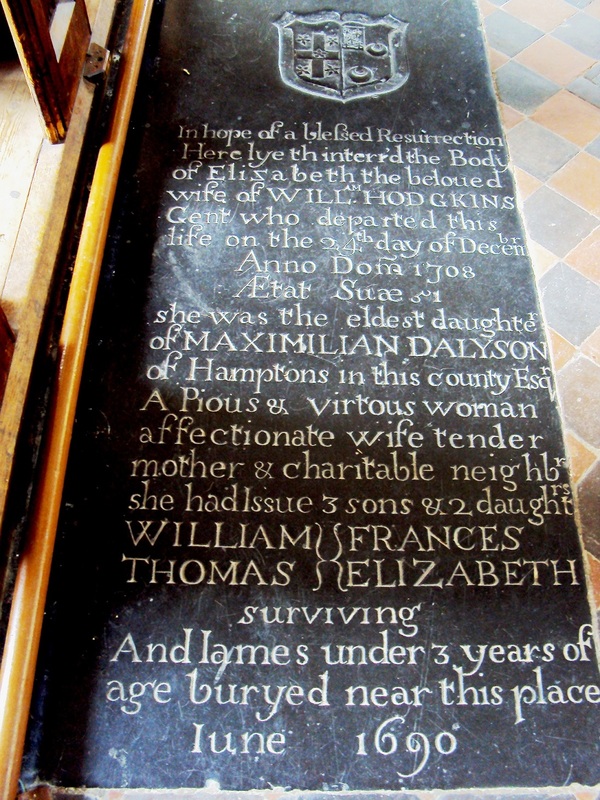 Elizabeth Hodgkins, widow of William Hodgkins, Esq, was buried in Plaxtol on 31st December 1708. Her son, William Hodgkins Esq. 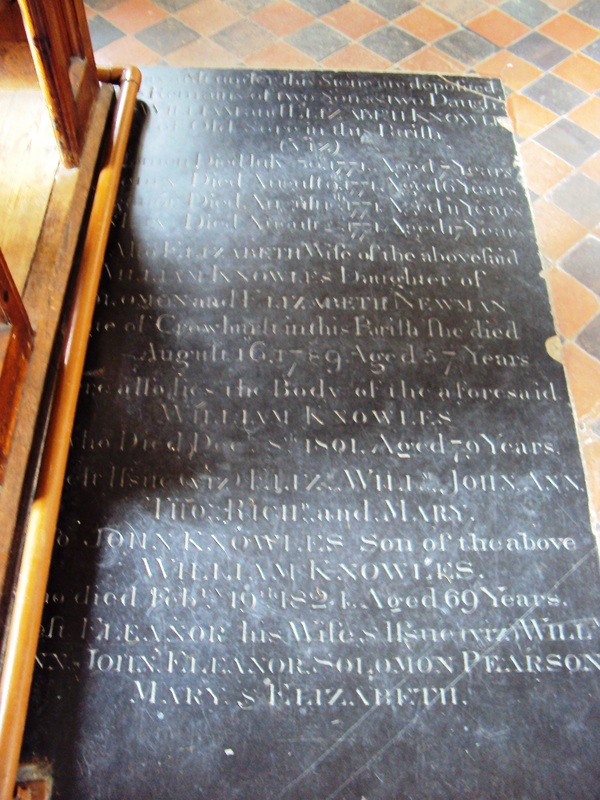 of Seal, near Sevenoaks, Kent, was buried in Plaxtol on 1st July 1723. 1. On the north wall of the chancel (moved from elsewhere when the chancel was added in 1894), a very ornate 18th century shield (decorated with a heraldic shield, scrolls, putti and a skull) in memory of Thomas Dalyson, who died on4 August 1741. 2. On the south wall of the choir, a plain oval monument to Thomas Dalyson’s 2 daughters by his first marriage, Mary and Jane. 3. On the north wall of the choir, a plain oval monument to Thomas Dalyson’s 4 sons by his second marriage, Peter, Maximilian, Thomas and William. 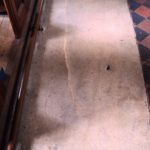 Elizabeth Caroline Williams, age 43, was buried in Plaxtol on 19th April 1816, the service being performed by Rev Edward Ince, Curate of the neighbouring parish of West Peckham. 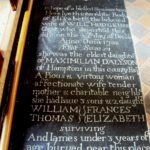 Caroline Elizabeth Williams was privately baptised on 24th May 1804, baptised in Plaxtol Parish Church on 1st August 1804 and, age 11 months, was buried in Plaxtol on 29th April 1805. Rev. 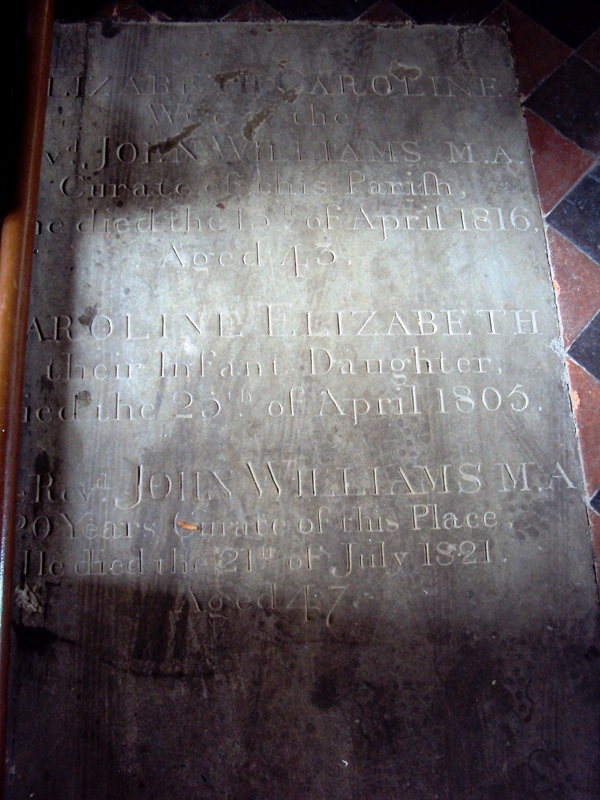 John Williams was Curate of Plaxtol from 1800 until his death, age 47. 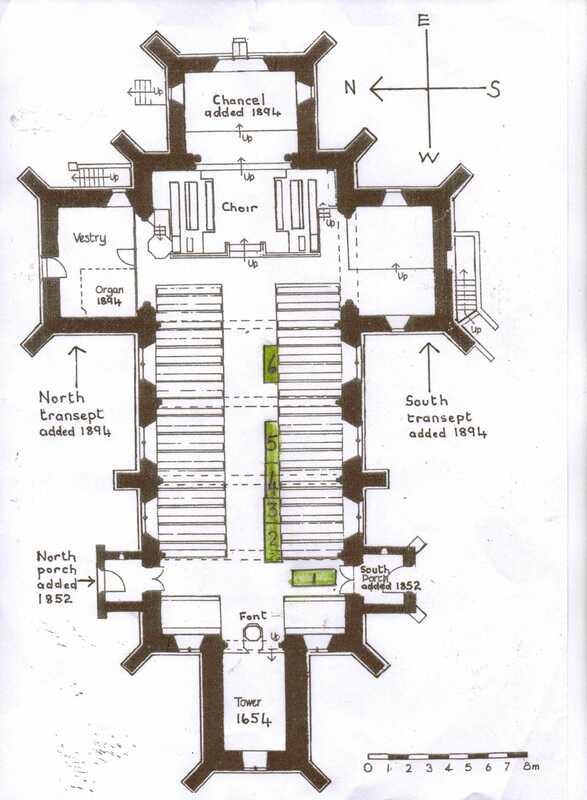 He was buried in Plaxtol on 26th July 1821, the service being performed by W R Wake, Officiating Minister. died the 25th of April 1805. He died the 21st of July 1821.